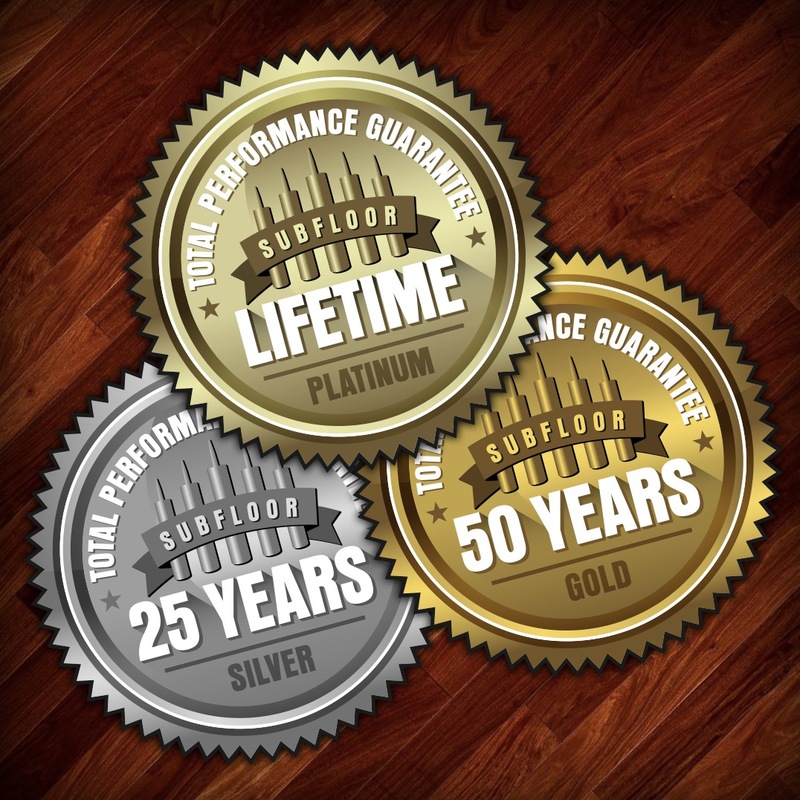 The three-tiered warranty program covers five Titebond construction adhesives for subfloor installation, ensuring against any squeaking or popping sounds for 25 years, 50 years or over the lifetime of the installation – far surpassing the coverage periods of other warranties on adhesives for subfloor applications. Titebond has such trust in the strength and durability of its construction adhesives recommended for subfloor installations that it has significantly extended coverage periods – even offering lifetime protection – on product warranties against squeaking or popping sounds. The coverage periods are far longer than any other warranty offered on adhesives used for subfloor applications, positioning the warranty program as the best in industry. Titebond’s Platinum Total Performance Guarantee warrants against popping or squeaking in subfloor installation of panels glued with Titebond Fast Set™ Polyurethane Construction Adhesive over engineered joists or trusses for as long as the original homebuyer owns the residence. Titebond’s Gold Total Performance Guarantee warrants both Titebond Heavy Duty Construction Adhesive and Titebond PROvantage™ Heavy Duty Construction Adhesive against pops and squeaks for a full 50 years. Contractors who prefer to use either Titebond All Weather Subfloor Adhesive or PROvantage™ Subfloor Adhesive still gain peace of mind with Titebond’s Silver Total Performance Guarantee against pops and squeaks for 25 years. The five Titebond adhesives recommended for subfloor installations – as well as other Titebond construction adhesives and sealants – are available at builder supply stores, flooring retailers and some major home improvement chains and co-op hardware stores. Stores that do not carry the products typically can special order them upon request. More information on Titebond products is available at www.titebond.com. About Franklin International: Established in 1935, Franklin International is among the largest privately held manufacturers of adhesives and sealants in the U.S. The company employs approximately 400 at its headquarters, laboratory and plant, in Columbus, Ohio; eight distribution centers across the U.S.; and a new plant in Guangzhou, China. Franklin provides local support to customers domestically and globally through a network of 75 independent sales representatives and direct field sales associates. The company maintains two divisions: the Construction Division, which manufactures a complete line of Titebond® wood glues for cabinet shops and hobbyists as well as a full line of Titebond® adhesives and sealants for construction professionals and do-it-yourselfers who demand the professional touch; and Franklin Adhesives & Polymers, which provides adhesives to industrial wood-assembly plants and pressure sensitive adhesives to label manufacturers.